We have always encouraged our scouts to think of something that might make our troop better. This photo is of the beginning of one such innovative idea. Eagle Scout Don Zvacek wanted to add something to make our campfires better. His idea was to use the Native American custom of the “talking stick” in our campfire planning. The Native Americans would tell stories around their campfires. The person holding the stick was the speaker. Everyone else had to respectfully listen to the story he was telling. When he was done, he would pass the stick to another person and that person became the speaker. We purchased the stick from Lyons Indian Store in downtown Tulsa and the idea became a reality on a Thanksgiving campout over ten years ago. We were having our campfire in the dining hall at Garland and there were lots of parents there as well. 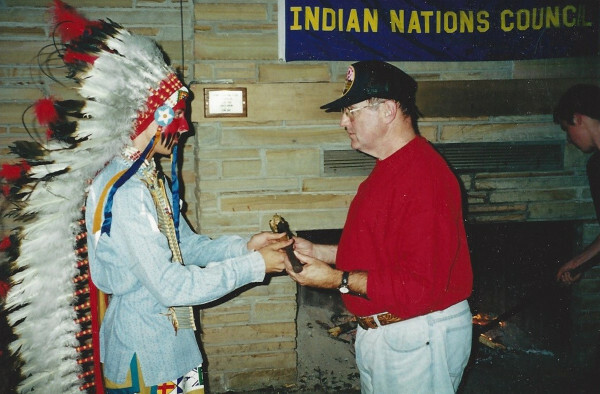 Don Zvacek appeared in the full regalia of an Indian Chief. This photo is of Don presenting the stick to me for the very first time. The rules were that the storyteller had to tell a story that was over five years old. This would be a unique way of passing down troop history. The speaker would select the next person to tell a story and pass the stick to him. As an adult, I was directed to pas the stick to a youth member. On the next campout, the youth member would tell a story and then pass the stick to an Adult leader. Back and forth for over ten years at almost every campout, from adult to youth and back to adult. Thanks Don Zvacek for an amazing legacy. It is called “the Zvastick”. This entry was posted in Scoutmaster and tagged Bill's Favorite Photos, Don Zvacek. Bookmark the permalink.